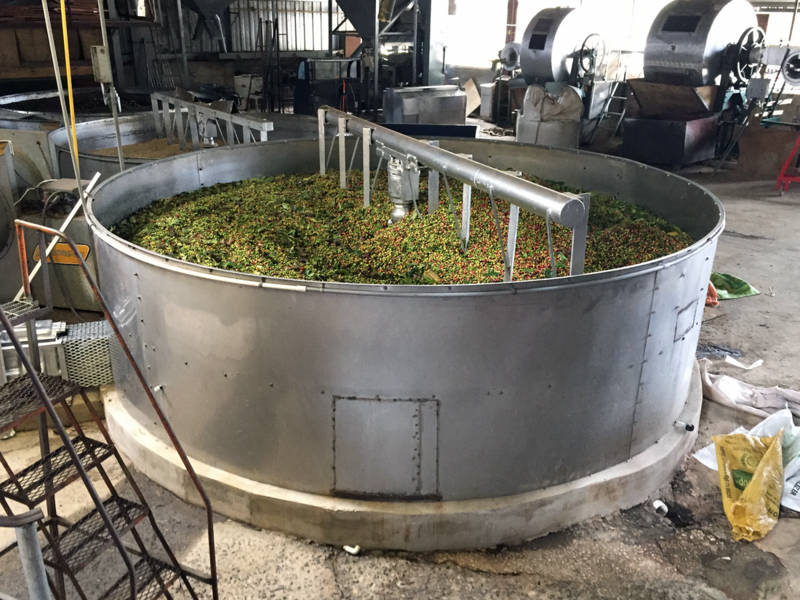 'This Was A Beautiful Place': Puerto Rico's Coffee Farms Devastated By Maria : The Two-Way Hacienda San Pedro had harvested just 2 percent of its beans before Hurricane Maria blasted through. The ripple effects will continue — it is expecting to run out of beans in December. 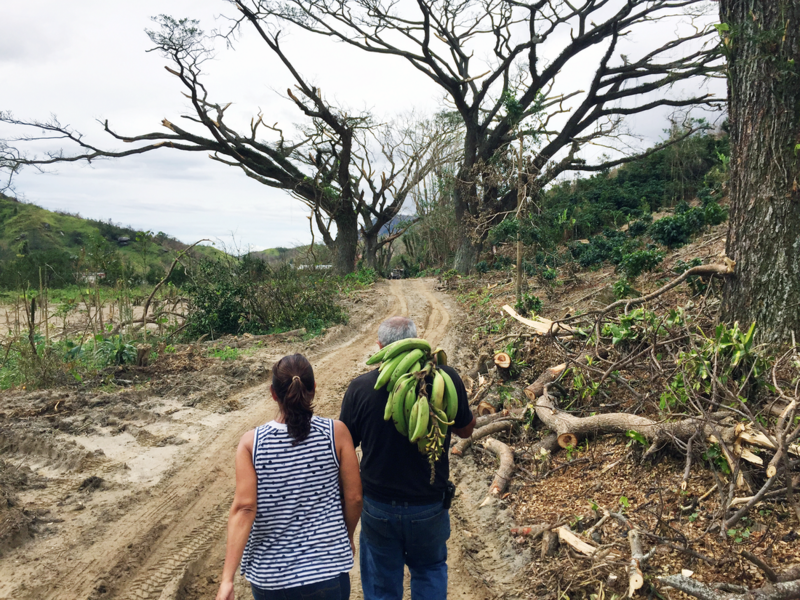 Rebecca Atienza and her father, Roberto, stand in a grove of decimated coffee trees. Hurricane winds stripped these trees nearly bare of leaves and beans. But in a few months, it probably won't. After a 2 1/2-hour drive into the mountains, through denuded trees and winding roads cleared by chainsaws, it's clear that this coffee company has been devastated at its source. When Hurricane Maria hit nearly three weeks ago, it wiped out more than three-quarters of the island's small agricultural sector overnight, by some estimates. "I think that maybe 90 percent of the plantation was destroyed by the hurricane," says Roberto Atienza, the third generation of his family to grow coffee on this land in central Puerto Rico. He has turned it into a specialty coffee company, with hand-picked beans that are dried in the sun. "In this moment we have a good market of the coffee, we have everything, all the coffee chains, but really we don't have coffee to continue," Atienza adds. He talks about shutting down the website. Exports, a major part of the business, no longer seem feasible. "This was a beautiful place with a lot of trees," she says. "It's like a different place." Rebecca remembers first surveying the damage after the hurricane. "No words. Like — what are we going to do now? And we have so much to do, but we didn't know where to start." Agriculture is traditionally important to Puerto Rico but is currently less than 1 percent of the economy. U.S. policy in the 1940s and '50s pushed manufacturing on the island over farming. The area was hit hard by the storm, and employees are dealing with rebuilding their homes. There also simply isn't much coffee that can be harvested. Roberto examines beans growing on a tree damaged at the roots. "This is OK, this is OK," he says, pointing to a few mature beans that are pink and red. But, he adds, "really the percent of trees like this is very, very small." Bins of coffee beans spared by the storm wait for processing. Harvesting had only just begun before Maria. "From here to the top of the mountain, everything looks like this," says Roberto, pointing to rows of what used to be full-fledged trees, reduced to spindly branches. "Those without leaves are coffee. No coffee, no bean, no nothing in some places." Finances are also going to slow the replanting process. The plantation has insurance, but Roberto says it won't cover all of the damage. He will focus his immediate efforts on areas in relatively good condition, then move on to the rest of the plantation when he can afford it. 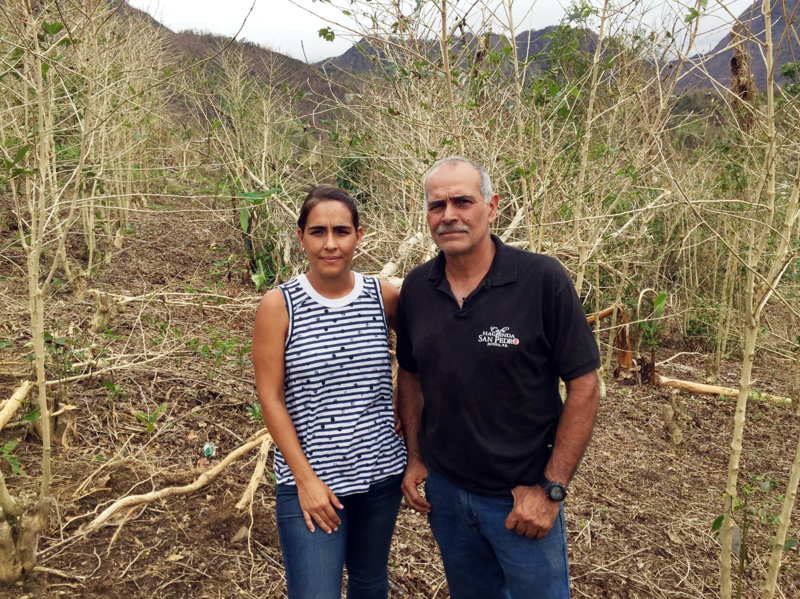 Roberto has a dollar figure for how much the damage will cost: "I think that the damage on coffee and crops and everything is more than $500,000." He expects the next good season will be in three years — as long as another hurricane doesn't hit. Rebecca and Roberto Atienza return from surveying damage to their coffee farm. Roberto is carrying a fallen plantain bunch he planned to give to a friend.